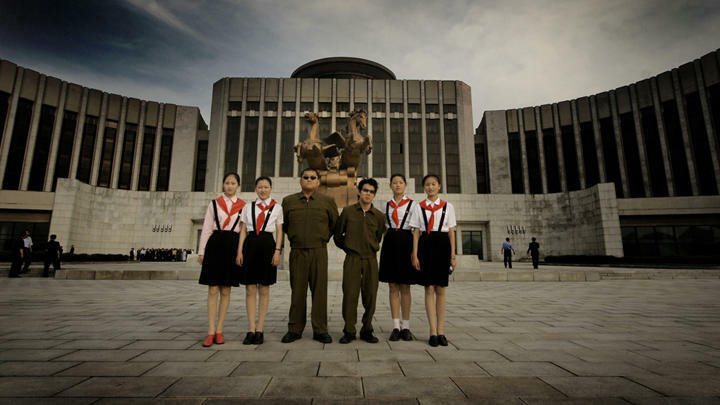 When Danish Zentropa director Mads Brugger decided to take himself and two Korean-Danish comedians to North Korea under the guise of a fake comedy project, he employed what he thought might be the magic word for repressive regimes seeking international image burnishing: “cultural exchange.” The film opens with a shot of Brugger, lying on a hotel bed, calmly reading Kim Jong-Il’s official Instruction Manual for Film Directing. The secret police who watched this footage every night apparently had no objection. What they somehow did not expect or anticipate was that Brugger would one day turn this footage into a feature film, and add narration in English explaining the shot as a ruse to reassure the North Korean secret police. In some ways, The Red Chapel is a hidden-camera “gotcha” stunt in line with the work of Sascha Baron-Cohen or The Yes Men. But the stakes are much higher. North Korea under Kim Jong-Il has the second-most tightly controlled media in the world (Eritrea is reportedly the worst), and a mind-bending record of the starvation and internment of uncounted millions of its citizens. While the footage that Brugger was able to capture doesn’t show anything the North Korean government doesn’t want the world to see, Brügger adds angry, politicized voice over to give context to the profoundly disturbing public performance being enacted for their benefit. 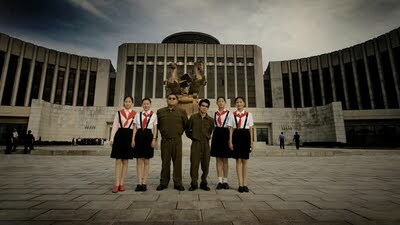 The Secret Police’s inability to understand Danish allows the three comedians to communicate freely on tape while they are guided past the hysterically smiling, clapping schoolchildren and the eerily sterile, advertising-free streets of Stalinist show-city Pyongyang. What happens is this: Brügger, Simon and Jacob arrive in Pyongyang and are greeted by Mrs. Pak, an effusive and elegant woman who regularly bursts into tears in patriotic pride. Jacob, a self-proclaimed “spastic,” is physically handicapped, sometimes confined to a wheelchair, and speaks with a slur; handicapped people are notably absent from all aspects of North Korean society, supposedly taken from their mothers at birth, institutionalized or killed. The menace of that reality is never spoken of (except in Danish between the filmmakers) — instead, Mrs. Pak and everyone else shower Jacob with frantic, smothering praise. Simultaneously, the government-issued theater professional assigned to supervising their performance decides that it would be better if Jacob’s part in the comedy be minimized; better, in fact, if the audience not even know that he was handicapped at all, and even better still if Simon could end the show by proclaiming his loyalty and love for the Dear Leader. Step by step, the North Koreans strategically co-opt the performance for the Dear Leader’s propaganda needs, as the Danes slowly to lose their minds trying to act normal in this world of fear, lies and excruciating politeness. In some kind of Vaso-Vega meta-theatrical freak out, soon everyone is putting on an elaborate stage play for everyone else. Filmmaker interviewed Mads Brugger at the Sundance Film Festival, a few days before The Red Chapel won the Grand Jury Prize in documentaries. Mads Brügger: Now I am becoming paranoid. Filmmaker: Does North Korea know about the film? Brügger: It was on a television program in Denmark, and they know about that one. They were not happy. The [North Korean] ambassador in Stockholm wrote a fax to the management of the Danish Broadcasting Corporation. He wrote that ‘the difference between man and animal is that man has a conscience, and that [Mads Brugger] has no conscience, and therefore must be an animal. I damn him, exclamation mark.” So it means that I’m not going to Pyongyang in the near future. Filmmaker: So your project began as a television series? Did it change when you turned it into a feature film? Filmmaker: Can you talk about the level of danger that you felt being there, and the risks involved? Brügger: [We were filming] before the two American journalists were captured and taken prisoner there. The only other case we knew about was an American reporter named Andrew Morse, who was I think the first American journalist in many, many years to be admitted to North Korea. And then they find out he’s making hidden recordings, or they suspect him of doing so, and they place him under arrest, destroy his computer and take away his footage, and then after two weeks in prison, he’s forced to sign a statement that says he’s an American spy, then he’s allowed to leave the country. But it really shocked me when these two American girls [Laura Ling and Euna Lee] were sentenced to twelve years in a labor camp – two years for illegal entry and ten years for intent to slander the name of North Korea. If that is the yardstick of how they measure things, then we most certainly would have been in the camps for many, many years. Filmmaker: How did you get the idea in the first place, to go to North Korea? Brügger: I was looking for a place where the use of role play, and pretending to be someone you’re not, would actually be morally justifiable because you’re basically exploiting something very important about how humans interact. It dawned on me that it had to be a dictatorship, and then I started reading about the last remaining dictatorships in the world, and then I stumbled upon North Korea and became obsessed with it. It defies anything you’ve heard about before. Because I had worked with communists in the Ukraine, I knew that a magic word for them was “cultural exchange.” It makes them all misty-eyed. So I knew that I had to offer them a cultural exchange project, and I knew that I had to offer them comedy, because dictatorships are really bad at handling comedy. All dictators are basically laughable, especially Kim-Jong Il. I knew Simon from Danish Broadcasting — he’s one of the channel’s most gifted comedians. Then I heard about this self-proclaimed “spastic” appearing in the comedy clubs, and I went to see him and it was amazing. Even though half the audience didn’t understand what he was saying, he was still really making an impact; he’s very bright and very funny. It dawned on me that if I would match them together I would make a very bizarre kind of Laurel and Hardy duo. I approached the North Koreans, went to Pyongyang to meet them, and to my amazement, they said yes. Filmmaker: How did you describe the show to the North Koreans? Brügger: I told them that it was a creative project that I wanted to film, that I would show how Simon and Jacob would experience North Korea, and how the North Koreans would react to their comedy show. I made it sound really innocent and naïve, and they really liked it. And what also tipped the scales in my favor was my resemblance to Lenin. Brügger: Yeah, yeah they were mad about it. They called me “Big Lenin” in Korean. Brügger: Living in the most oppressive authoritarian state in the world really warps, destroys and perverts human sentiment and human emotions. It’s very difficult for them to handle human emotions. Mrs. Pak is still a mystery to me, why she was dealing with Jacob the way she did. At one point I thought she must have been cruel or sadistic; on the other hand she seemed to be genuinely interested in Jacob. It became more and more obvious that Jacob was having an emotional impact on her. We even thought at one point that maybe she had had a handicapped child at one point. Filmmaker: That was certainly my suspicion. Brügger: Yes, because I asked a Korean person I know, if the things she was saying like, “I feel Jacob is more than my son,” if that was a normal thing for a Korean thing to say. And she said that it was very extreme, even for Koreans. Filmmaker: Can you talk about Jacob’s handicap, and how the North Koreans reacted to it, and what it was like for Jacob? Brügger: What amazed me was how bad they were at dealing with the comedy show, and Jacob’s part in it. Obviously the audiences in some ways were directed [by our minders]; they were briefed before they saw our show. When they’re saying to Jacob that he has to act like a normal person playing a handicapped person, that really shows the contempt they have for handicapped people. Because in a perfect socialist state, there are only perfect socialist bodies making perfect socialist babies, according to their doctrine. A person like Jacob is not supposed to exist. Wherever we went in North Korea, they would think that Jacob was either very, very ill, or very, very drunk. They had never seen a guy like that before. Filmmaker: I want to ask about the scene where you attend a rally, a huge march with thousands of people chanting in unison to commemorate the day of the “American Invasion.” You, Jacob in his wheelchair and your female minders end up at the front of the march, and Jacob refuses to chant or pump his fist in a very rebellious way. Whereas you do chant and pump your fist, and keep warning Jacob in Danish that what he’s doing is extremely dangerous. Brügger: The march was a very schizoid, schizophrenic moment for me, because one part of me was very full of admiration and clearly recognizing the grandeur in Jacob’s courage and his will to rebel against this extremely repressive regime, while standing in the heart of that regime. The other part of me wanted to silence him completely, because I was terrified. So it was a very complicated moment, and also I was drunk at that moment. Brügger: The last five days there I was more or less drunk all the time to keep my nerves in balance. Filmmaker: Did your own behavior surprise you, when you watched the footage? Brügger: Well, whenever we were filming, we were conscious of the fact that the North Korean secret police were going through all the footage while we were sleeping. So we had to keep that in mind all the time. Also we were trying to do very basic comedia del’arte, you know, with Simon and Jacob being two clowns, and me being the evil white clown. But when I see it today I’m still quite impressed about how calm we all seem to be, when we really should be running, screaming about in terror.